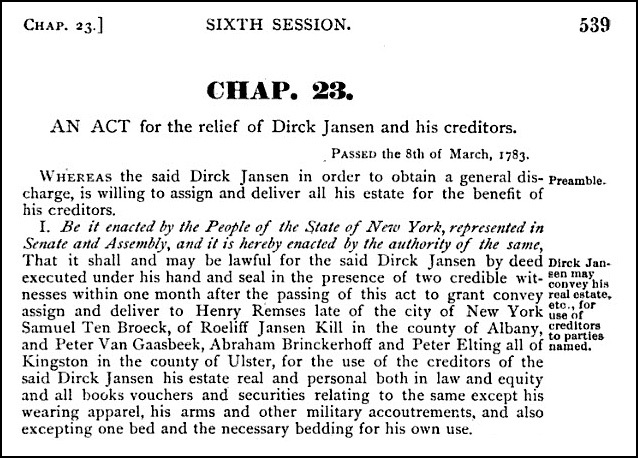 Dirck Jansen of Albany County, New York, had gotten himself into a pretty pickle. He was in debt — seriously in debt — and his creditors were closing in. And there wasn’t a whole lot he could do to raise cash and try to stay afloat. There was this minor little matter called the Revolutionary War that was occupying a large part of his attention — he’d served as an officer of the 10th Albany Militia Regiment1 — and people who owed him money were often unreachable behind enemy lines. 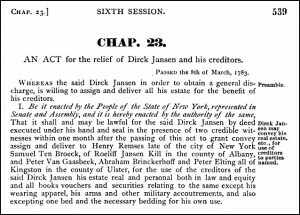 So in early 1783 Jansen did the only thing he could think of to do: he applied to the New York State Legislature for relief. And two-and-a-half pages of statute later, he became, officially, one of New York State’s early bankrupts. But there are always the exceptions… and Dirck Jansen and a few others in scattered records early on out in the states prove that it’s worth looking for them. Fascinating information on early bankruptcy law, Judy. What a challenging time this man experienced – left with very little after a lot of hard work I’m sure. Thanks for leading us along this legal pathway! So 1783 holds the story of an early bankrupt. Your posts always fascinate. I did not realize that the watershed of bankruptcy proceedings was the Chandler Act in 1938. I suppose that must have been prompted by all the debts of the Great Depression. My uncle lost his farm in 1933 and had to farm another man’s land until he could buy back his farm in 1943. As for Jensen, I was glad to find, reading along, that they left him his “dwelling house” to put his “one bed” in. I’m glad that the law sometimes gives people a way to survive instead of being turned out into the street.